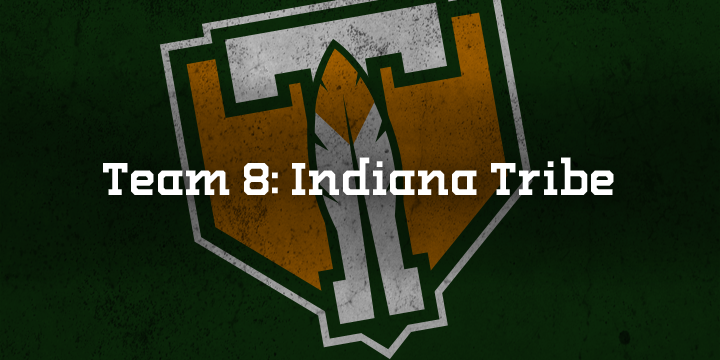 The "Indiana" word mark looks great to me! The plate behind the logo is something I've never seen before! Good stuff! 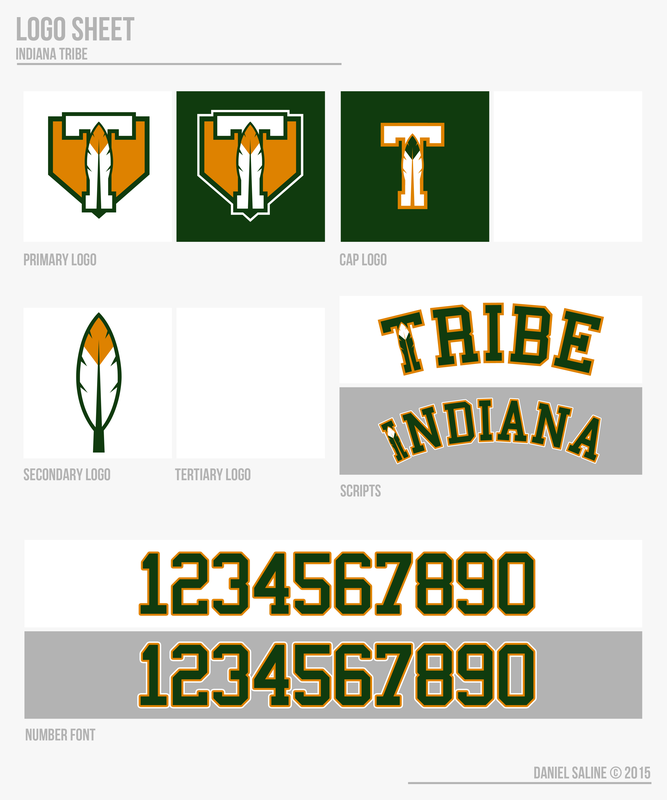 Did you ever think about not switching the orange and green on the hat logo? I think it would look cleaner if you switched it back to match the primary logo. 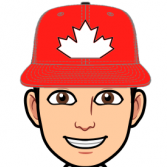 Favourite Logos:Nashville Predators, Atlanta Thrashers, Boston Bruins, Calgary Hitmen, Minnesota Gophers, Michigan Wolverines, Tennessee Vols, Kentucky Wildcats, Atlanta Braves, Milwaukee Bucks. When will the next team be up? I tried out what you were saying, and the double-outline on the cap logo really didn't fit the rest of the set. I'm thinking about scrapping the current primary logo and making the secondary the primary because I'm not entirely fond of it in general and I don't really like how I used the double outlines. How does that sound? This series is far from dead. I've been working much more on the new teams (I'm close to finishing 15 or 16) than the current ones, including a couple of classic looks, which have been fun. I've got a couple sets of updates for you all. First is Arizona. I decided to go with the BFBS second alt, for the road and at home. It's not a primary color, but black is still in the scheme, so I'd say they're one of few teams that it's okay to have a black jersey for. Indiana is by far my favorite set in the group. The feather plate makes a strong primary and that cap logo is a thing of beauty. Yeah, we're definitely on our way out of the black trend. I don't see a whole lot more of black jerseys, maybe two at most. And those are coming from relatively new teams as well. 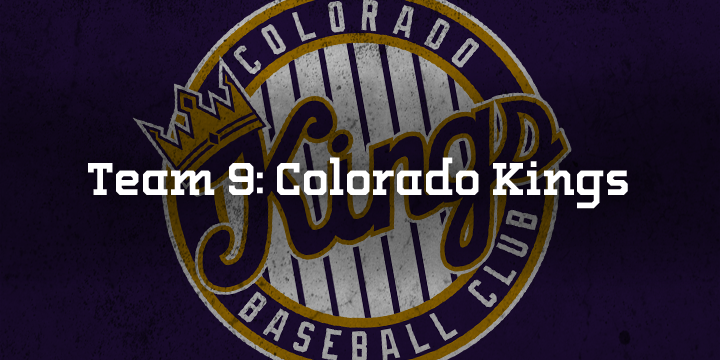 Formed in 1948, the Colorado Kings are one of the classic teams in the USBL--although they haven’t retained the same name, unlike many other “classic” clubs. Originally named the Colorado Chieftain, the team went through one of the most damaging scandals and series of lawsuits the USBL has ever seen in the early 1960s. The team formerly had a great relationship with the Arapaho Tribe in Eastern Colorado--the artist who created the logo was 100% Arapaho--but that relationship was tainted and ultimately destroyed by a comment made by owner Richard Graham, who was caught using colorful language in reference to the tribe. These comments leaked to the public very quickly, and the Native American population was enraged. Dakota Oxendine, the team’s best player at the time, demanded a trade within the next week and said he would walk if a deal was not made. The Arapaho Tribe took the issue to court and wanted their name changed, as they no longer wanted Graham’s club to represent their people. Eventually, the Graham vs. Arapaho case reached the Supreme Court, and the Tribe won 5-4. The Chieftain were forced to give up their name for good. Richard Graham resigned and sold the team before the verdict was reached, and never worked in baseball again. At the start of the 1963 season, two things survived the scandal and name change: Centennial Stadium and the team’s pinstriped uniforms, although they changed color. 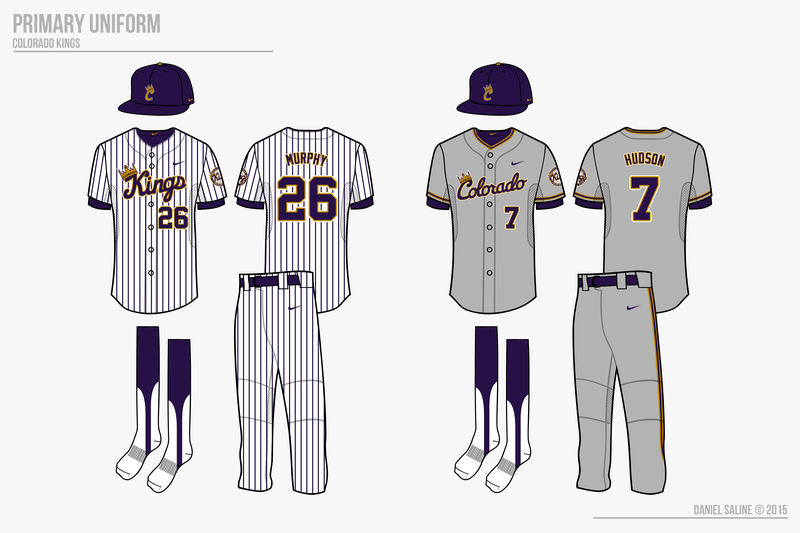 The team chose the Kings with a purple and gold color scheme, in reference to the line from America the Beautiful--”Purple mountain majesties,” which was written about Colorado. The Kings have won seven titles, most recently in 2010 and 2012, but they have fallen from the pedestal and have struggled mightily over the past two years. After their most recent championship, five players retired and rode off into the sunset, two starters left for free agency, and one was traded away, leaving only Charlie Murphy, the shortstop-turned-third basemen. Now 34, the team is infamously nicknamed “Charlie and the Children” because of the extreme youth of the team. Hopefully this youth will translate into a dynasty as this group matures and becomes the King of the league again. The front office doesn't like the idea of being in rebuilding mode, in fact, they're looking to make some moves, specifically in the pitching staff this season. Perhaps the 2015 campaign is the one where the Kings make their comeback. The name change brought a switch from red to purple, and the Kings have never looked back. No throwbacks have ever been worn to the Chieftain days, partly because of how sensitive that wound still is. Both scripts on the current jerseys are classic, and the whole set is basically untouchable at this point. The primary home and road are two of the highest selling jerseys in baseball, largely because of the scripts. All in all, the Kings need not change their identity again. Centennial Stadium outlives even the Kings--the building held soccer and football several decades before the baseball team came to town. 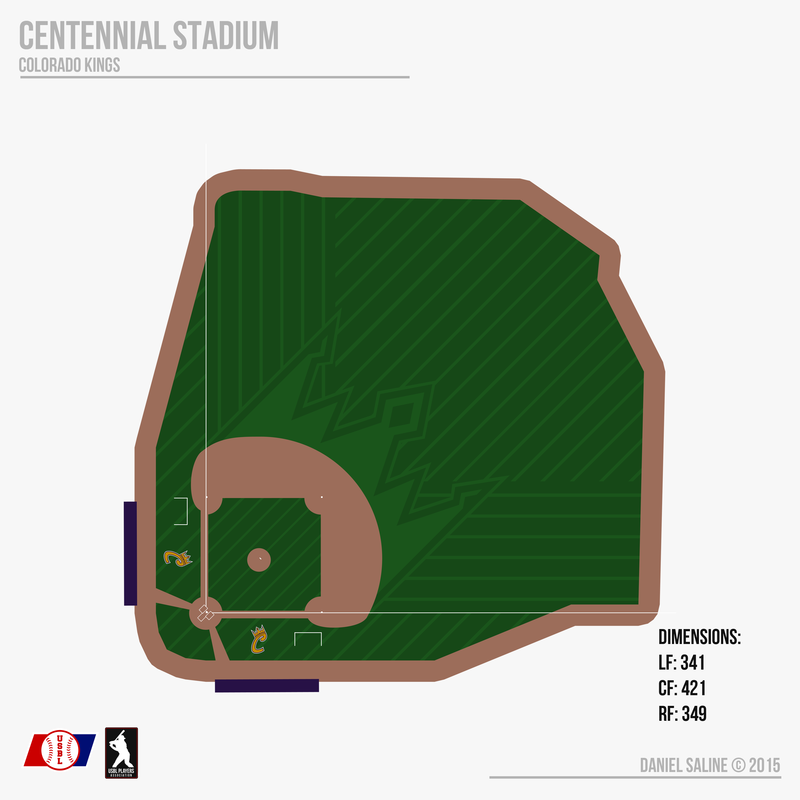 In fact, Centennial Stadium will be celebrating its centennial birthday in 2025, which figures to be a huge celebration in Denver. The unique juts in the field were the effect of how the bleachers had to be adjusted once the stadium became a multi-sport facility. The pinstripes have become so representative of the club that they’re mowed into the grass of the field. Just a brief note in hindsight: The wordmarks, logos, and numbers on purple will all stand out more than they do here. I think any blurryness you may see is the product of a bad image quality. Also, yes, the Kings are my fantasy team on the boards. However, they were originally designed for this series, so I think it works considering they're in two different universes. Other than that, it should be alright. C&C appreciated, thanks for checking this out! Pretty decent series so far. Not too much to complain about. 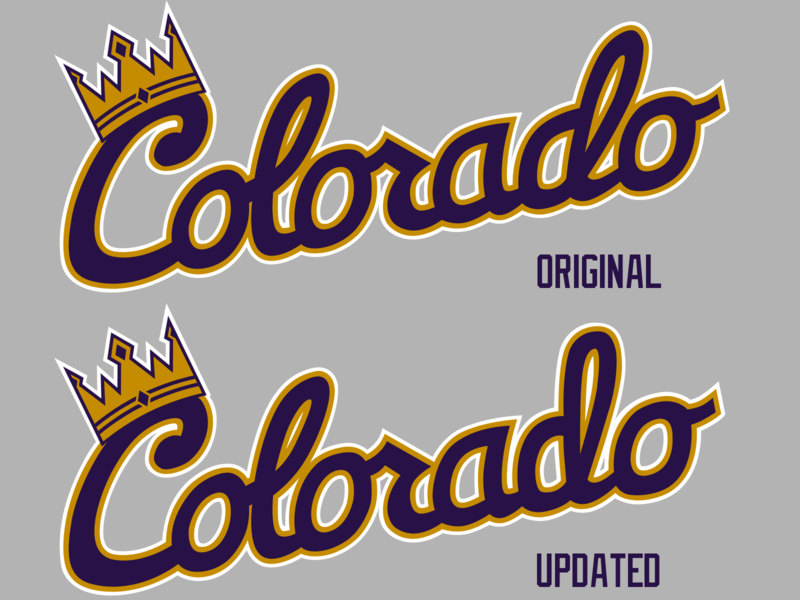 As for the latest entry: Everything is solid for Colorado except for the "COLORADO" script. To me, the d looks more like a cl, making it read as COLORACLO. I say remove the "loop" and make it one solid and straight line. 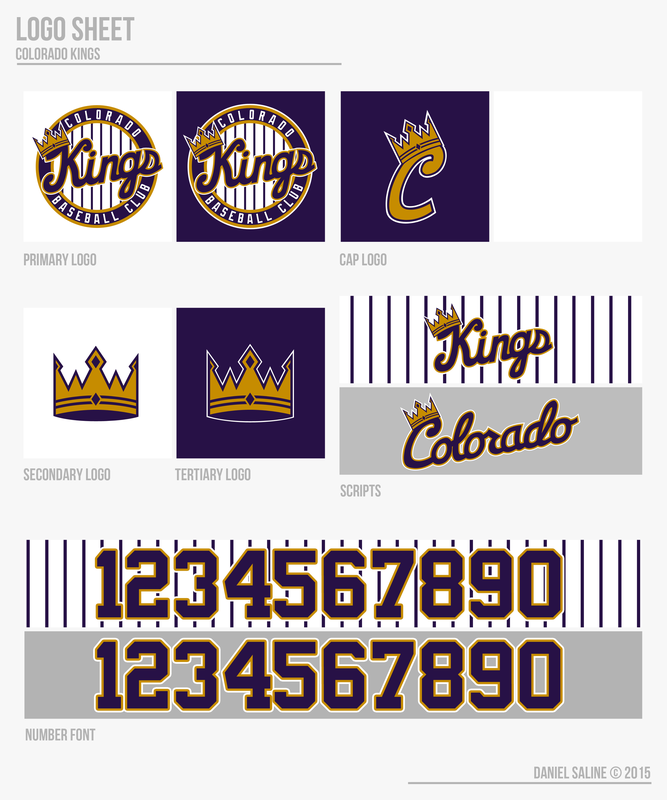 Is it possible to see what road pinstripes would look like for the Kings? I love road pinstripes when possible, and the Kings seem like a team it could work for. That being said, this whole series is a jaw-drop so far. I friggin love the Tribe the most, with Grizzlies being a close second. Also, love all the little details in everything you've posted, right down to the number font. Also, I like how you've taken feedback. That always makes a series even better. If I can make a suggestion as to where a team should be, I think a team in Flint, Michigan would be fun. Keep up the amazing work here. That's interesting, I personally don't see it. Anyone else notice this? To me a straight line wouldn't fit the rest of the scripts. Thanks, the fields have become one of my favorite things to make. 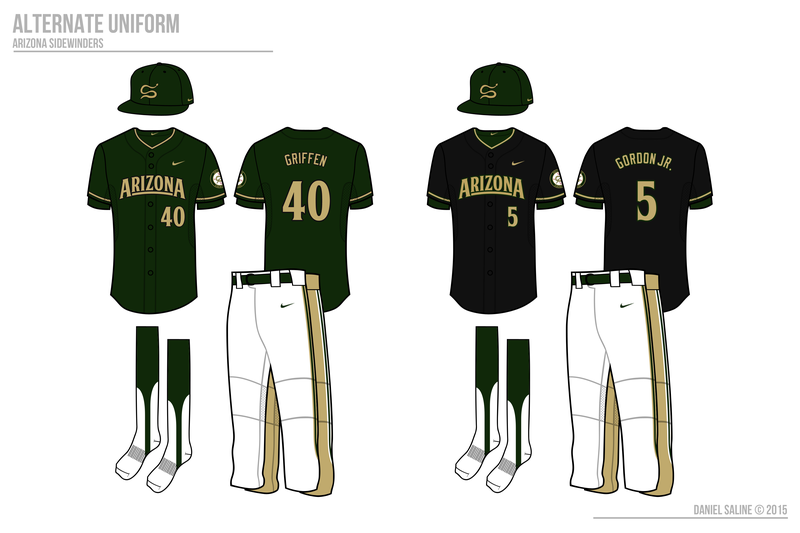 The road pinstripes didn't work like I thought they would. They're too dated for me at this point and it didn't look as good. And thanks! I always try to respond to feedback, as that makes the teams better and it actually makes it worth it for you guys to share your opinions. As for team suggestions, those are all set in stone. But, 2016 brings the newest wave of expansion teams, so if I need suggestions, I'll certainly make a thread for that. I have a suggestion for a team location... New Orleans! Again, I'm not taking suggestions. No need for this to derail and turn into a "celebrate my city" thread. Thanks. 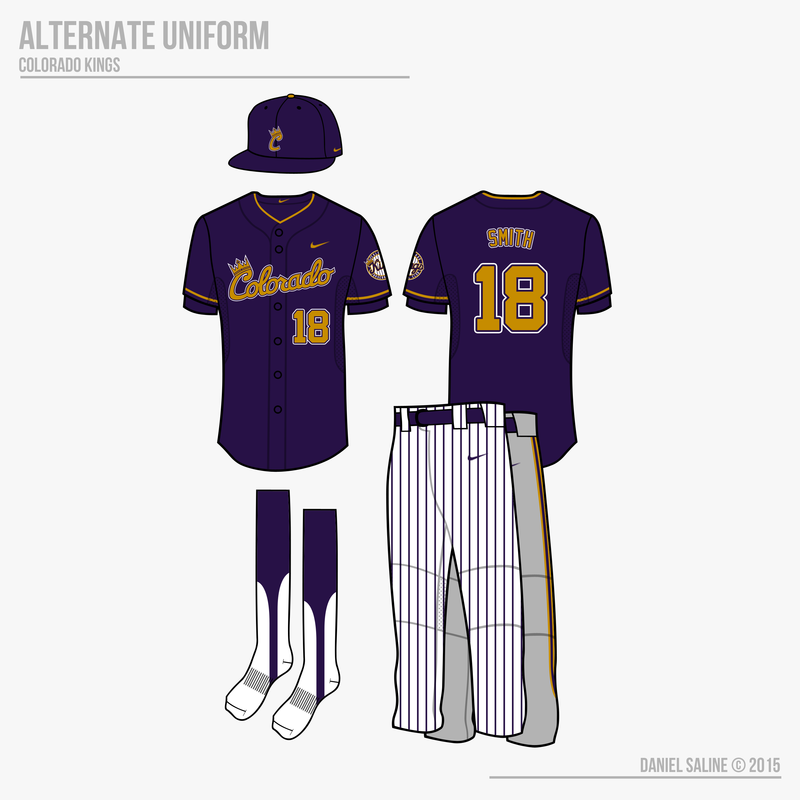 Colorado might have just become my favorite team... Those scripts are perfect, the field is very cool and unique, and the home whites are incredible. I think I would go broke with all the USBL jerseys I would buy haha! Me as well Thanks, I'm glad you like them! Hm. Gotta say I agree with the sentiment that the looped "d" looks odd. I don't know that I'd go as far as saying it looks like "Coloraclo," but just that I never see a "d" looped like that. I see it as an L first, but then need to backtrack mentally to figure out that it's actually a completely different letter. This graphic kind of shows which letters I typically expect to see loops on. Obviously, everyone's experience and expectations are different. 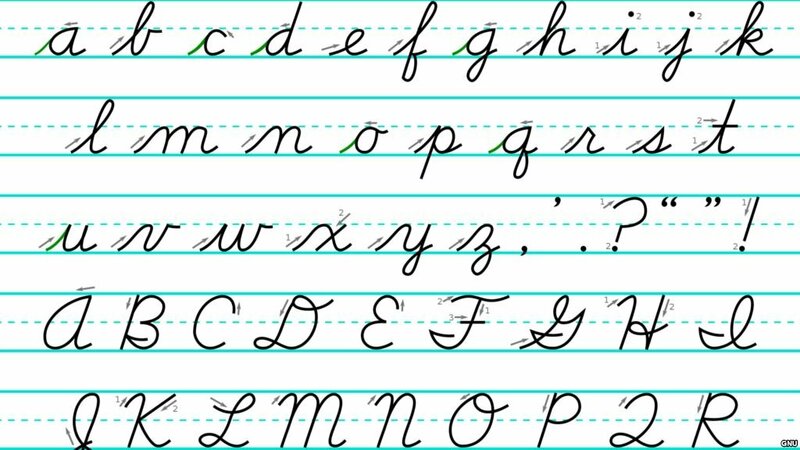 Is that from a particular font, or do you draw that by hand? That's a fair point. I drew the font by hand, and I guess I gave it a loop for more character and I figured it would flow better with the font.